Adult Fans of LEGO (AFOLs) listen up! 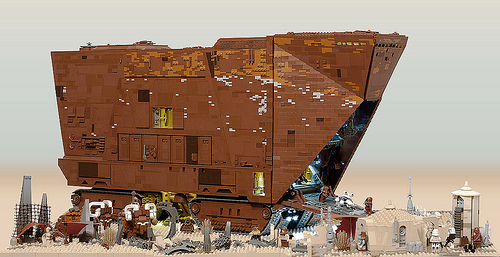 You have something new to drool over – a Sandcrawler replica made with LEGO bricks. You might be thinking, “So? So many things have been created out of LEGO!” Then again, this one is nothing to scoff about. 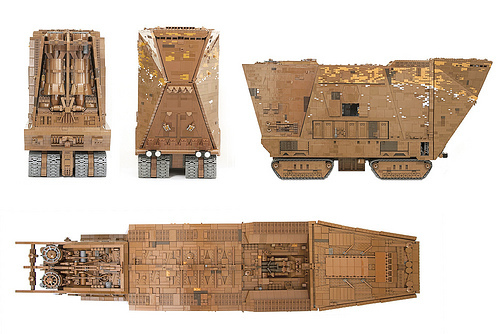 This overview of the LEGO Sandcrawler gives you an idea of the scope of the project. Again, 10,000 LEGO blocks! 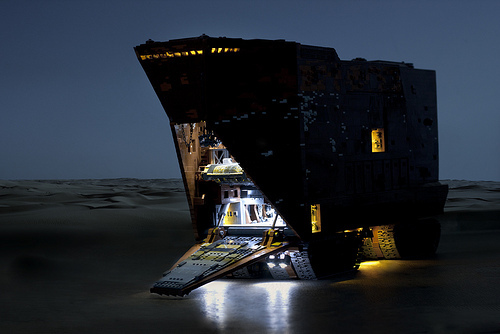 This diorama gives the Sandcrawler some context. And this makes use of lighting to add some drama. Brilliant piece of work – and I don’t think anyone will contest that. In case you want more (and I am sure Star Wars fans will want more), here is a short video clip showing the Sandcrawler in action. The brains behind this? A guy who calls himself marshal banana on Flickr. For more photos and details, head on over to Flickr and check out the photostream.